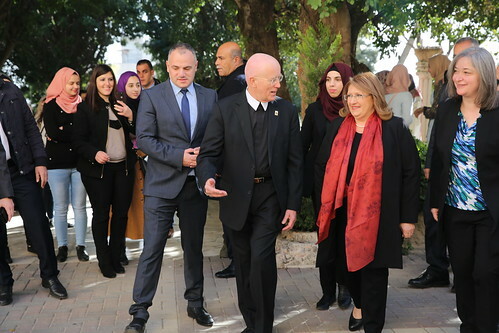 President of Malta Marie-Louise Coleiro Preca visited Bethlehem University campus and gave a lecture on “Tourism for Peace” on Thursday, 31 January 2019. Vice Chancellor Brother Peter Bray and the Executive Council welcomed President Coleiro Preca and the delegation accompanying her. Brother Peter praised the good relations between Bethlehem University and the Republic of Malta, especially the academic cooperation, and expressed his hopes to develop this relationship in the near future. President Coleiro Preca said that the people of Malta view with utmost importance the suffering of the Palestinian people. She gave a lecture entitled “Tourism for Peace” in which she explained that tourism can open a wide area of rapprochement between people especially in Bethlehem. It should be noted that she has been appointed by the United Nations World Tourism Organization as a Special Ambassador for Sustainable Tourism. After the lecture and on behalf of Bethlehem University, Brother Peter presented a gift to the visiting President as a souvenir. She then had a tour on campus passing by the Institute of Hotel Management and Tourism and the Clinical Simulation Center of the Faculty of Nursing. The President was accompanied by Deputy Prime Minister and Minister for Health Christopher Fearne, Minister for the Environment, Sustainable Development and Climate Change José Herrera, Parliamentary Secretary for Local Government and Communities Silvio Parnis, and representative of Malta to Palestine Reuben Gauci. Palestinian Minister of Tourism and Antiquities Rula Ma’aya, Palestinian Ambassador to Malta Fadi Hanania, Mayor of Bethlehem Anton Salman, the Honorary Consul of Malta in Bethlehem Elias Al-Arja, Chancellor Archbishop Leopoldo Girelli, Chair of the Board of Trustees Claudette Habash, faculty, staff, and students attended the lecture.